Shell Aviation is the world's oldest transnational company in airplanes refueling business. It made its first fuelling back in 1909. Now it works at 800 airports located in 90 countries. Every day they provide fuel uplifts for up to 20,000 aircraft and supply over 23 million gallons (87 million liters) of fuel. One of the word's biggest fuelling companies, Shell Aviation has much experience in establishing joint ventures. They operate at 138 airports in 60 countries. Shell Aviation does not stop at that and actively invests 70 new ventures in 37 countries. 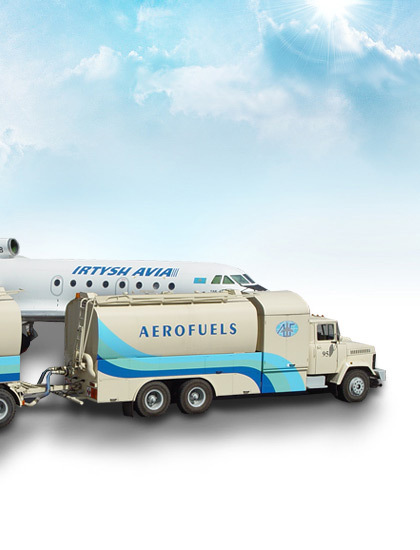 For many years Shell Aviation has been major partner of the Aerofuels Group in aviation fuelling at foreign airports. The establishment of a joint venture with Shell Aviation in 2001 became one of the outstanding events in Aerofuels' history. Under contract with Shell Aviation Aerofuels provides jet fuel supplies for more than 100 Russian airlines at more than 60 airports of the world. The volume of fuel supplied by Aerofuels in foreign countries under contract with Shell Aviation outside of Russia averages 30,000 tons a year. In the autumn of 1997 Shell Aviation offered Aerofuels to chose some Russian airports as locations for joint fuelling facilities, which would meet international quality standards. A tremendous volume of work has been done over a few years in order to evaluate and analyze passenger and freight traffic, general performance of 15 airports, i.e. in Voronezh, Yuzhno-Sakhalinsk, Samara, Ekaterinburg, Rostov-on-Don, Ulan-Ude, Petropavlovsk-Kamchatsky, Izhevsk, Ufa, Bishkek, Kazan, Bratsk, Perm, Moscow (Domodedovo and Sheremetyevo airports). A unique computerized system called Investment model was used to evaluate feasibility and anticipated profitability of future facilities. Despite financial turmoil in the Russian and world economies of 1998 and 1999, Shell Aviation continued to push forward its project. It was a clear sign that credit rating of Russian companies was still high, and Western investors viewed Russia as an important aviation market. Modernization of fuel depots, installation of up-to-date equipment, commissioning new mobile refuellers (modular jet fuel loading units) and pipelines (some made of stainless steel), building fuel tanks and laboratories according to latest standards reduce airport current expenses. This modernization can also result in an increase of port calls by airplanes of airlines of Russia and other countries, not satisfied with prevailing service quality standards at Russian airports. The Joint Venture will be integrated into the Shell International Aviation Trading System, which secures constant support of various experts in technical maintenance, engineering and quality control and guarantees insurance coverage for fuel depots. According to IATA requirements, the Joint Venture provides a USD 500 million insurance coverage of each and every accident related to or associated with problems caused by the actions of the JV within its responsibilities in the process of refueling aircraft. Availability of this insurance makes it possible for all air companies to use Russian airports where the JV is present with full awareness that the service they get meets or exceeds all Russian and international standards. Moreover, Shell and Aerofuels guarantees that jet fuel is always available for its clients. The project can significantly accelerate development not only of fuel depots but also of all airport infrastructures. This will improve quality of work of airport facilities, because all services provided by the joint venture should comply with health, safety and environment protection regulations. According to The Aerofuels Group General Director Vladimir Spiridonov, launching refuelling work at Domodedovo is major achievement and a significant event for the Joint Venture Shell and Aerofuels. “Practical work of the JV has started. Most significant is that it happened in Moscow, at Domodedovo airport. We hope, that airport authorities will go on supporting us, while we intend to assist business development of the facility and attract new customers”.